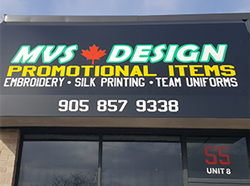 MVS Design Inc. is a family-owned business and has been in operation since 2014. We offer custom embroidery, screen printing, promotional products, signs/banners, team uniform embroidery & stitching, heat transfers. We use top of the line embroidery & sewing machines. Graphic designing logos on site. We have the solution for all your promotional events.